The following questions are often asked regarding D&M Fire Safety in particular or fire protection in general. Click the question to view a specific response, or scroll down to review all answers. How often do I need to inspect my fire extinguisher? What type of fire extinguisher do I need for my apartment or home? Why do I have to replace my pre-1984 Fire Extinguisher? What are the five classes of fire? What is a K-Class fire extinguisher? 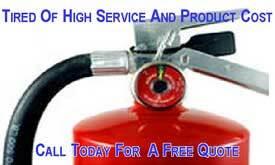 Why don’t you inspect or service plastic head or disposable fire extinguishers? How often do I need to inspect my fire suppression system? Are some "clean agents" banned or are about to be banned? How do I know these new clean agents are safe? What are the new clean agents? How Can I Dispose of Halon? Why Do I have to replace my Pre-UL300 Kitchen Hood Fire Suppression? Do you install kitchen ventilation hoods? According to NFPA 10 and Vermont Public Safety, fire extinguishers in a commercial, business or rental location needs to be inspected annually by a qualified service company such as D&M Fire and Safety Equipment. The owner of the fire extinguisher should also preform a monthly "quick check" of the fire extinguisher. D&M can show you how to do a monthly inspection. The reccommeded type of fire extinguisher for a home or apartment is a 5 lb ABC Dry Chemical Fire Extinguisher. 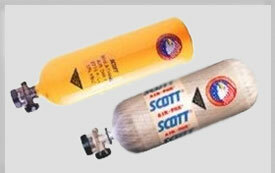 These are inexpensive, but very effective in extinguishing A,B,and C fires. There are five classes of fires. All fire extinguishers are labeled, using standard symbols, for the classes of fires on which they can be used. A red slash through any of the symbols tells you the extinguisher cannot be used on that class of fire. A missing symbol tells you only that the extinguisher has not been tested for a given class of fire, but may be used if an extinguisher labeled for that class of fire is not available. CLASS C: Energized electrical equipment, including wiring, fuse boxes, circuit breakers, machinery and appliances. CLASS D: Combustible metals such as magnesium or sodium. CLASS K: For use on fryolator, or grease producing appliances in kitchens. 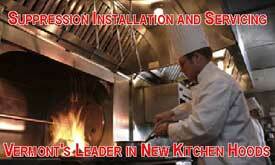 Wet Chemical fire extinguishers are the best restaurant kitchen appliance hand portable extinguisher available. The new extinguishers are tested and approved for Class K fires. They contain a potassium acetate based, low PH agent that was originally developed for use in pre-engineered cooking equipment fire extinguishing systems. The Class K extinguishers are tested on commercial deep fat fryers using the same type of fire test as UL300 pre-engineered restaurant fire extinguishing systems. The agent discharges as a fine mist which helps prevent grease splash and fire reflash while cooling the appliance. The Class K extinguisher is the ideal choice for use on all cooking appliances including solid fuel charbroilers. Disposable or plastic head fire extinguishers sold at the “big box stores” are non-serviceable and are for residential use only. 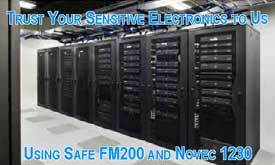 We do not recommend or service these due to their lack of performance, and serviceability. For a few dollars more you can get an Amerex commercial quality fire extinguisher with a 6 year warranty that is serviceable and the most effective out there. Why trust yourself and your property to anything but the best? All fire extinguishers have different ways of discharging or removing them from service. Contact D&M for the best way. According to NFPA and Vermont Public Safety all kitchen, gas stations, clean agent, industrial, or vehicle suppression systems need to be inspected semi-annually. Upon completion of inspection by a qualified service company such as D&M Fire, a Vermont Public Safety Proof of inspection Tag will be affixed. This verifies that your system is current and violation free or your system needs work. Know when to go. Fire extinguishers are one element of a fire response plan, but the primary element is safe escape. Every household should have a home fire escape plan and working smoke alarms. Click here for class information and short video. Can the items be replaced? Can you afford down time caused by fire damage or clean-up? Are there redundant systems? Can you still operate if this system goes down? If you answer no to these questions, then you need to look at fire protection not only for the structure of the building, but for the assets it contains. That is special hazards fire protection. Though the pre-1984 extinguishers should work, if properly maintained, they do not represent the current technology and user safety features that are now required. Fire extinguishers provide a first line of defense to control incipient stage fires. Users of fire extinguishers need to have confidence in the extinguishers and must be able to operate them effectively with limited training. Implementation of the latest technology and compliance with the most up-to-date national standards will help ensure fire extinguishers operate effectively and as intended when called upon to do so. No. Starting in the 1960s, Halon 1301 was the principal agent used in clean agent extinguishing systems. However, Halon was found to have a high ozone depletion potential, so manufacture of Halon was banned in 1994. There is no ban on the use of Halon, however, and many Halon systems are still in service. There are also no plans to ban Halon use at any time in the future. However, the EPA strongly recommends using one of the recently developed Halon alternatives. There are three commercially available Halon alternatives that are very effective at suppressing fire. The EPA phased out Halon production as part of the Clean Air Act of 1990. Another part of that Act was the Significant New Alternatives Policy (SNAP). Under SNAP, the EPA evaluated substitute chemicals and alternative technologies to ensure that they wouldn't cause greater damage to human health or the environment that the potential ozone depleters that were being replaced. Each of today's clean agents is SNAP approved. Yes, part of the SNAP approval process includes testing for adverse effects in humans at recommended design concentrations. Each of today's clean agents is safe for humans and safe for the environment as well. Halon 1301 is also safe for occupied areas at recommended design concentrations. However, some people consider carbon dioxide a clean agent as well because it shares the non-corrosive, no clean-up features. While carbon dioxide is a very effective fire suppressing agent, it is not safe for use in occupied areas. At this time, the three commercially-available clean agents for total flooding applications are INERGEN, manufactured by Ansul, FM-200, manufactured by Great Lakes Chemical Company, and FE-13, manufactured by Dupont. Donate it to the Department of Defense Ozone Depleting Substances Reserve. You can return it to your distributor for resale. Send it to a Halon recycler. If you have a very small amount of Halon 1301, or if you have Halon 1211 or 2402, Friends of the Earth can help you locate a regional organization that will take your Halon as a service. Why do I have to replace my Pre-UL300 Kitchen Suppression System? Cooking appliances have historically been protected with pre-engineered (packaged) systems that use an extinguishing agent that chemically reacts (saponification) with cooking oil to create a thick blanket of foam to suffocate the fire and prevent the escape of combustible vapors, thereby preventing re-ignition. Other fire protection solutions involving engineered systems, alternative extinguishing agents, and elaborate enclosure just can't compete with pre-engineered systems utilizing an extinguishing agent that has the ability to saponify when applied to the burning cooking oil. A little more than a dozen years ago, the fire protection industry came to the realization that the benchmark test for listing these pre-engineered systems was not rigorous enough to reflect a typical installation. The fire test standard was updated to require using fryers with vegetable oil. Dry chemical systems that passed the old test are not able to pass the new test protocol. Only wet chemical systems are able to pass the new fire tests and be listed for this application. Unfortunately, only part of the problem was solved. Although dry chemical systems can no longer be installed for the protection of cooking appliances and associated hood and duct systems, the listing standard does not impact existing installations. Similar to other listing standards, it only affects the listing of products. NFPA 101, paragraph 9.3.2 requires that existing systems be approved in order to remain in place. Specifically, it says: "Commercial Cooking Equipment. Commercial cooking equipment shall be in accordance with NFPA 96, Standard for Ventilation Control and Fire Protection of Commercial Cooking Operations, unless such installations are approved existing installations, which shall be permitted to be continued in service." Paragraph 9.2.3 is referenced throughout NFPA 101, and applies to existing hospitals, hotels, and restaurants. The problem is with existing systems and the statement "unless such installations are approved existing installations". Since the word "approved" means "acceptable to the authority having jurisdiction", this implies that documentation would exist that the authority has approved the existing installation. From the standpoint of the fire equipment distributor (FED), there is a certain liability to servicing a system that is not documented as an "approved existing installation" in accordance with NFPA 101. MostFED's won’t assume this liability andare justified in not servicing the systemsuntil the installation becomesan "approved existing installation". Since NFPA 101 requires that these systems need to be "approved existing installations", it is up to the facility owner to acquire documentation from the Authority Having Jurisdiction and provide it to the FED. If these systems can't be serviced because they are not "approved", the facility owner should replace them with systems that meet NFPA 101, paragraph 9.3.2. The only other option to an "approved existing installation" is one that meets NPFA 96, paragraph 10.2.3 which says "Automatic fire extinguishing systems shall comply with UL 300 or other equivalent standards and shall be installed in accordance with the requirements of the listing." Allowing a dry chemical fire extinguishing system that met listing criteria and is now deemed to be inadequate is probably not the intent of the committee in establishing this requirement. Only systems that meet the currently accepted level of safety established by the listing criteria outlined in NFPA 96 paragraph 10.2.3 or equivalent should be permitted to remain in place. We do not sell or install kitchen hoods. However we do work with a local hood company, that offers the lowest price around. He uses only CAPTIVE-AIRE hoods, the #1 brand. We do install the fire suppression systems into new and exsting hoods using Amerex KP and Zone defence lines. 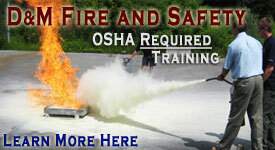 D&M Fire and Safety Equipment have been in business since 1989.